This article provides answer(s) to one of the most frequently asked questions on this blog, "How does WAEC, NECO or NABTEB count the number of words in students' English essays?" It is no news that the required number of words of the English essays of these examination bodies (WAEC, NECO and NABTEB) is 450 words. As a result, students are expected to write 450 words while answering any of the essay questions of WAEC, NECO or NABTEB English examination. It is also important to note that there is no penalty for writing more than 450 words but marks are deducted if a student's essay is less than 450 words. Having said that, how do you know whether your essay is up to or less than the required number of words? Do you count your words one by one to ascertain this or you just assume your essay has reached the required number? I am cocksure you do either of these but also believe that you will never be a victim of such ignorance after reading this article. 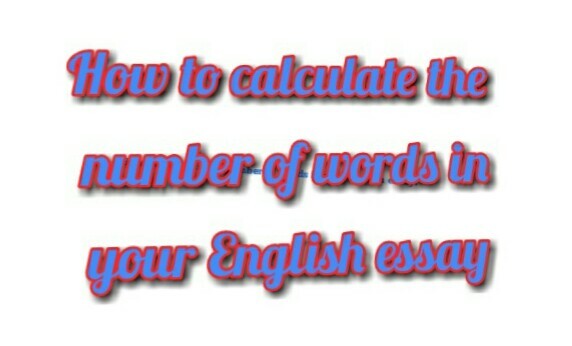 You can easily get the number of words of your English essay using the formula: Number of words per line multiple by Number of lines covered. For example, while writing your essay, if each line of your paper (answer sheet) contains nine (9) words and your essay covers forty two (42) lines, you will get the total number of words by multiplying 9 by 42, which will give you 378 words. This simply means that if you write ten words per line, you need to cover 45 lines to get 450 words. The higher the number of words per line, the lesser the number of lines covered. The implication is that those with large handwriting will have to cover more lines to get the required number of words unlike those with small handwriting. Note: While counting the words, English examiners pick the lines at random, and if two out of the lines picked consist of eight words each, it is assumed other lines contain eight words. And the number of words of your essay will be calculated based on that. Therefore, it is very important you ensure that the number of words in each line does not vary. However, if it must vary, the difference shouldn't be much. With the formula above, you can easily calculate the number of words in your English essay. Meanwhile, you can check the marking scheme for English HERE.